An update on round 8 – mostly! – of our eight teams’ league campaigns. The BEA B were the only team to feature twice since our last update. Having drawn with Kilkenny A earlier in the season, hopes were high for another decent showing against Kilkenny B, who are also one of the strongest teams in the division. Alas, things didn’t go our way at all, and only Yubo avoided defeat against a very strong side in a match which ended 4½-½. Kilkenny appear from the scoresheet to have broken the 150 point rule on the top two boards, but as they won both anyway, it can hardly have made much difference. The next round followed a week later, and this time it was a resounding win, with only Zhengjun and the returning Eric giving up draws in a 4-1 hammering of Dublin. The result leaves the team second in the table, though other teams have games in hand, which at this late stage of the season will probably prove key. It’s a long wait now until the next match – a big tie at home to Celbridge in late April. Zhengjun is top scorer on 5½/8. 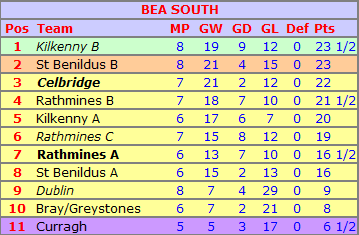 The BEA A, meanwhile, are two games behind at this stage. Their most recent outing saw a 3½-1½ defeat against Rathmines B; they play Rathmines C on Wednesday. It looks like it’ll be another season in the division for both sides – although it’s worth remembering the Bs were promoted at the start of the season – and of course as ratings move, players can move up divisions even if the team doesn’t. For the As, Ben is top scorer on 5½/6, and needs 2/4 for a board prize. Also facing off against Rathmines were the Ennis, and their season is still gathering momentum after a 4½-1½ win – which could have been more except Odhrán lost from a piece up in time trouble – against a Rathmines B side who two weeks later held former runaway leaders Drogheda to a 3-3 draw. This puts the Louth side in reach for the first time since that 5-1 hammering on the opening day, and although it would take a huge win against relegation strugglers Phibsboro on Wednesday to take over at the top, the fact that it’s even possible is a huge boost. 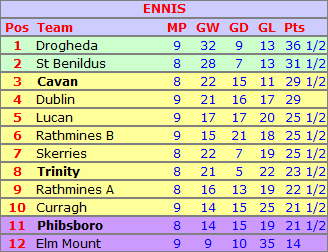 But of course promotion is more important than the title, and in that regard, Cavan are arguably the ones to be really watching out for; if we go into our final round game with our current two point lead intact, we would know that a 3½-2½ defeat would be enough for promotion. Lara is top scorer on 7½/8 – and indeed, only two Drogheda players have scored more in the entire division, both from one match more. One more win will earn her a board prize. 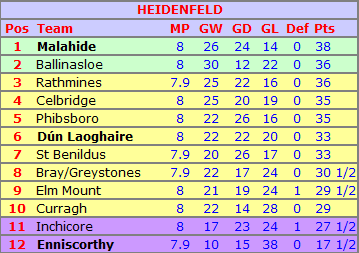 The Heidenfeld – who may soon be the Heidenfeld A – are just about keeping in touch at the top, and are on just 1½ points above 50% with the score against Bray at 3-4 with the final board to be played on Wednesday. Things were looking bad from early on; we had subbed in half the rampant Ennis team, but Lara and Leon lost, while Slavko was introduced to the Kilkenny Gambit and looked lost at one stage, then surely drawn, but he managed to win a double rook ending to get us off the mark. Ciarán M hung an exchange, but soon realised his opponent had followed up incorrectly and got a lovely position, while Michael’s game was completely mad, with a sac on f2 followed by his knights coming in to e3 and d3, and the winning the a1 rook – but it still had to emerge for him to be material up. He probably missed a win along the way but took a draw, while Ciarán’s knight completely dominated his opponent’s rook and he won. Brendan sacced a piece but his opponent defended well and took the win, while Dylan looked in trouble in an early endgame, but then won a piece to have Q, R, B+2 v Q, R+5. Both players had very little time left at this stage, so a draw was agreed as we escaped with a battling three points. We face Dún Laoghaire next, though our promotion hopes probably hinge on getting a big win at home to struggling Enniscorthy, who have only managed to travel to one away game so far this season with a full team. Brendan is top scorer on 5/8; I can overtake him if I win the postponed round 8 game, though I need to finish with 4/4 for a board prize. Playing alongside the Heidenfeld were the Bodley A – except they actually weren’t playing because someone in the school had taken the box with all the pieces and sets and we had no idea where they were. We were fortunate that we still had some pieces from the BEA’s Saturday game against Kilkenny to allow the Heidenfeld game to go ahead, but had no choice but to scratch against Knights of Éanna (although we did chance a blindfold challenge!). The pieces turned up again once the school re-opened after mid-term – the geography room was being used for mocks, so the sets had been put back elsewhere – but unfortunately, this was too late to avoid the Bodley A ending the season on a disappointing note. Joe ended as top scorer for the second season in a row, this time on 3/6. The Bodley B, meanwhile, were in Gonzaga last week short of Carl and Ryan, who were off playing chess. A strange excuse to miss a chess game, but it was the Community Games in Malahide which had taken them away. In the league game, Martin and Taylor lost quickly enough to a Gonzaga side who ended the afternoon as South Division champions, but Fearghal and Karel had interesting games which swung late on; Fearghal lost from a winning position, while Karel turned around a losing one to win. 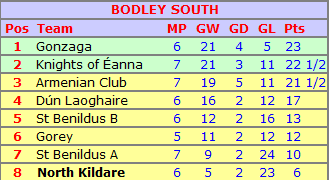 Karel is the top scorer on 3/3; the team finish their season next week with a game against bottom side North Kildare. 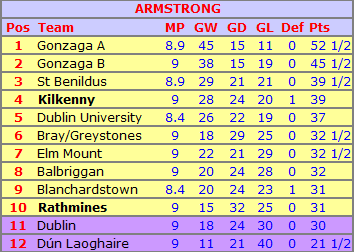 Alongside the Bodley in Gonzaga were the Armstrong, up against champions-elect Gonzaga A. Gonzaga haven’t lost a league match over the board in 5½ years – to a Phibsboro side led by Stephen Brady – but they came close here, and still could lose as there’s one game to be played on Wednesday. Zdravko let slip a winning position on board 8, but excellent wins for Mihailo and Gerry against Killian and Henry (FM), along with a win for Brendan, who was a piece up early on, saw us emerge with a share of the spoils and a result which will hopefully cement third place and our highest Armstrong finish in 20 years. Zdravko is top scorer on 6/9, though his board prize chances are now gone. 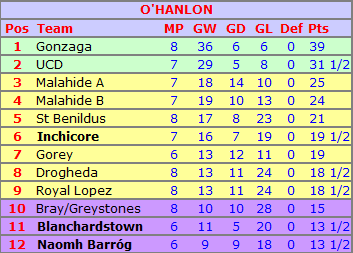 Finally, the O’Hanlon were in Malahide, and though they had the advantage in terms of ratings, Malahide are very much a club on the up, and came away with a narrow win. Ronan was the latest victim of the Patrick Brozynski hex, though Felix and Finn picked up wins and Desmond drew with draw specialist Séamus Martin to keep the side comfortably clear of the drop, with the bottom two still to play, although the picture is still slightly unclear while others have games in hand. Ronan and Finn are top scorers on 4½. Well done on beating Gonzaga A! Shows it can be done.